The William Shelton Story Pole "Lifting the Sky" was dedicated May 14, 1940. It stood on the Washington State Capitol campus for 70 years. Recently it was taken down and placed in storage awaiting restoration. The pole features 24 skelalitut (spirit) figures on each side of a rectangular structure. Each figure represents a morality story told to teach how to behave responsibly and with integrity. Carved in a traditional Coast Salish (please go to Stylistic Differences to read more about the distinctions between the Coast Salish and northern tribes/bands) style this pole is highly sculptural; the figures stand out from the background in high relief. To achieve this the original log needed to be in excess of 7 feet in diameter at the base. The carver then proceeded to carve away everything which was not one of the figures. Story poles differ from totem poles in that they are designed to relate morality stories teaching humans how to behave responsibly and with integrity, and about cultural beliefs; they do not represent any person or peoples as can totem poles. Totem poles from the northern tribes such as Haida and Tlingit can have several meanings: to display family crests and history, to communicate tell stories, and to memorialize specific events/people. This story pole is a significant artifact in the larger collection of Coast Salish work. Within the relatively small body of work that exists today, this pole is a prime example of the type of work done in the early part of the twentieth century. Shelton’s work heralded a period of renaissance of Coast Salish art and culture, and influenced the carvers who followed him, helping to build a body of Coast Salish work and preserving and carrying on traditional carving techniques and styles. This pole is also significant for its ability to continue to educate contemporary carvers, story tellers, and anyone interested in promoting and sustaining the vitality of Coast Salish art and history. The Olympia pole represents a period in which the Coast Salish people were attempting to not only hold onto, but to share their traditional cultural beliefs and practices. The carving of a story pole and its placement in the community-at-large in an effort to convey traditional Coast Salish stories which teach us how to live as better humans is an historical event at any time. At the time this pole was raised it represented the concerted efforts of William Shelton and the white community to reconcile the past and prepare for the future. Shelton endeavored to teach both native and white communities a means by which this could be done. That this Shelton pole has been so wholeheartedly embraced by the people of Washington and our state government is a testament to the enduring qualities of the stories told by this pole and the importance of the traditional cultures that still make up Washington’s population. At the time of my analysis the 71 foot pole was segmented into seven sections and rested on sandbags placed on tables in the conservatory. The pole was in such poor condition with rot permeating the structure through the second section from the top. I photographed each section, noted areas of deterioration, and took multiple paint samples and samples of the wood surface. During my evaluation I noted extensive deterioration indicated by fungal growths, large areas of mold, and visible rot both internal and external. The story pole was completely covered in paint throughout its life. This created a situation in which the paint trapped moisture in the wood right from the beginning and starting the deterioration that has finally culminated in the poor condition in which we now find the pole. The structure of the high relief figures makes them a natural conduit for wicking moisture from the body of the pole as well as being extremely vulnerable to atmospheric moisture (88.5% humidity annually, 50.79 inches of rain annually). The application of polyurethane sealant on the end grain of figures could not completely seal the end grain making it a channel for the escape of moisture. I believe that moisture has collected in the base of the larger figures causing the paint to stretch and create pockets; once the area dried out the paint cracked compromising the integrity of the entire paint job. As well, UV rays would have quite rapidly (3-5 years) broken down any polyurethane present even through the layers of paint. 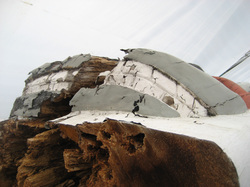 Significant areas of the layers of paint have separated from the wood leaving a fertile ground for mold growth which encourages further paint separation from the wood. Both the wood surface and the back of sections of separated paint are covered with several species of mold. The paint layers are so thick they are like leather, sheeting and falling off the pole. 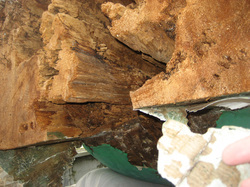 Cedar logs typically rot from the inside out due to softer heartwood. Here the rot has completely undermined the entire section, spreading from one side to the other.